Matt Bezak glass studio employs the lost wax glass casting process in creating these unique pieces. This method has been used by ancient Egyptians, and by Rene Lalique in the Art Nouveau period. 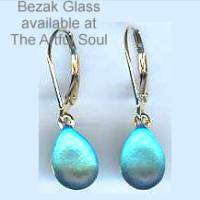 Bezak Glass is distinctive in finished shapes and effects in light, mounted in 14kt gold and sterling silver for jewelry, some pieces accented by diamonds. A note about gold and silver prices...we have in-stock pieces for prices shown below, but replacement prices will change according to current market value. 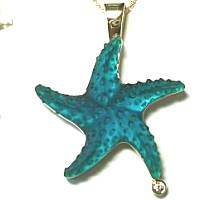 1 inch cast glass starfish is intriguing with the bumpy texture. Rich teal color, like the deepest lagoon, is luminous as you peer through the sides, more opaque as viewed toward the top. Mounted securely to 14kt yellow gold on the back with attached bail, there is a small diamond sparkling from one leg. Comes on 16 inch 14kt yellow gold chain (style may vary). Smaller pendant is 5/8 inch across, 14kt YELLOW GOLD setting is solid in back with bold heavy gauge curve along the bottom, that carefully protects the glass wave. Wave is luminous turquoise blue with frosted finish, clear toward the splashing crest. A small diamond sparks from inside. Comes on 16 inch 14kt yellow gold chain (style may vary). Smaller pendant is 5/8 inch across, sterling silver setting is solid in back with bold heavy gauge curve along the bottom, that carefully protects the glass wave. 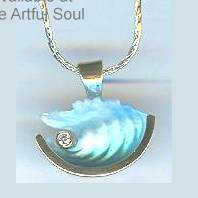 Wave is luminous turquoise blue with frosted finish, clear toward the splashing crest. Comes on 16 inch sterling silver chain (style may vary). Medium-sized pendant is 7/8 inch across, 14kt YELLOW GOLD setting is solid in back with bold heavy gauge curve along the bottom, that carefully protects the glass wave. Wave is luminous turquoise blue with frosted finish, clear toward the splashing crest. A diamond sparks inside. Comes on 18 inch 14kt yellow gold chain (style may vary). 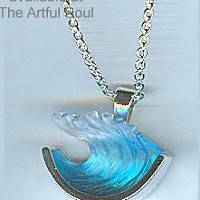 Medium-sized pendant is 7/8 inch across, sterling silver setting is solid in back with bold heavy gauge curve along the bottom, that carefully protects the glass wave. Wave is luminous turquoise blue with frosted finish, clear toward the splashing crest. Comes on 16 inch sterling silver chain (style may vary). 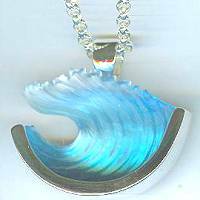 Large cast glass pendant is 1.25 inches across, shiny sterling silver setting is solid in back with bold heavy gauge curve along the bottom, that carefully protects the glass wave. Wave is luminous turquoise blue with frosted finish, clear toward the splashing crest. Comes on 18 inch sterling chain (style may vary). 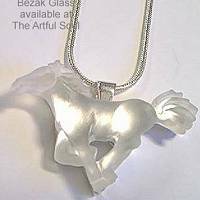 The cast glass galloping horse has its tail flying and mane flowing, a luminous frosted clear that glows like a moonstone. Measures 1-1/2 inches across nose to tail. Carefully backed with shiny heavy gauge 14kt yellow gold. Comes on 18 inch 14kt gold chain (style may vary). 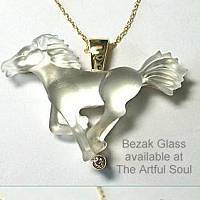 The cast glass galloping horse has its tail flying and mane flowing, a luminous frosted clear that glows like a moonstone. Measures 1-1/2 inches across nose to tail. Carefully backed with shiny heavy gauge sterling silver. Comes on 16 inch sterling chain (style may vary). 3/4 inch across, cast glass winged heart piece glows from inside in deep turquoise blue, mint, yellow and pink. The colors shift from various viewing angles. Mounted on 14kt WHITE GOLD, solid on back for protection with attached bail. Comes on 16 inch 14kt white gold chain with lobster clasp. A drop of luminous turquoise blue in cast glass is backed with 14kt yellow gold and dropped from 14kt yellow gold leverback earwire. About 1 inch dangling length.